Monday I had the day off. Grumpy went to work as normal and I got busy first thing and cleared out the spare room. Iit sure made me feel a whole lot better – and it was all done before 11 AM! That gave me the rest of the morning to run to the store for a couple of items and figure out what to feed my Aunt Ann and her friend Ron for lunch. When I started lunch I came across a bag of Morningstar Crumbles I had in the freezer and I thought about Chili for dinner. I decided to use the crumbles and pray that Grumpy wouldn’t notice that it wasn’t real meat. I cooked up some brown rice (jasmine) and stirred in a little butter and cilantro when it was done. Served the chili on top of the rice and it was delish! The only comment Grumpy made was “is this flavored rice?” I said “yup” and left it at that. He never knew….and last evening? He ate the remaining leftovers without a single comment – which in this house is a good thing. If Grumpy’s making a comment it usually is because he’s not sure he likes something and he certainly wouldn’t eat it two nights in a row if he didn’t like it! My chili passed the test! I’m so happy and I will definitely be using the Morningstar Crumbles again! Saute the onion and pepper in 1 tablespoon olive oil until tender. Add the frozen burger crumbles and cook 3-4 more minutes until crumbles are thawed. Stir in chili, cumin, and chipotle chili powder. Add 1 jar spaghetti sauce and 1 can tomato sauce. Place in crockpot on low temp for 2-3 hours, then turn to warm until ready to eat. Bring 2 cups of water and salt to a boil and stir in rice. Simmer until rice is tender, about 20 minutes. Once rice is cooked stir in cilantro and margarine. 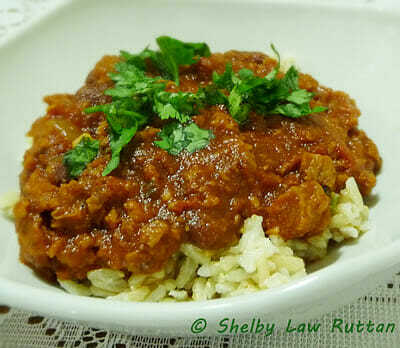 Serve chili over rice and top with more cilantro if desired. Mmmm I do love a good vegan chili. I do crave it when it's really cold out. I love all kinds of chili's…except for the one that uses the pre packaged mix…not crazy about that stuff. Chili is a great comfort food! So much to say…1st, Grumpy must be Picky-picky husbands twin because I can' even imagine serving crumbles…but you've given me courage. Also..you say brown basmati rice only takes 20 minutes to cook? Is that true? If so, where has it been all my life. Coleen, I was surprised at how you really couldn't tell that it wasn't ground beef! It had really good flavor and I think was even better the next day. Basmati rice does not take that long to cook…which is much better than regular long grain brown rice which seems to take forever!